L 22″(56 cm) W 50″(127 cm). Description: Sexes similar. 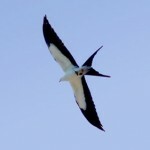 Plumage variable. Dark brown above, usually light below with dark belly band. 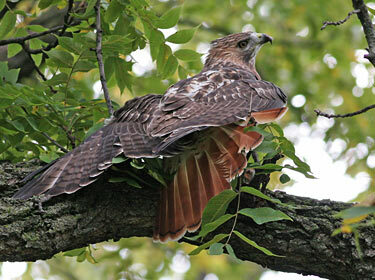 Rust-colored tail has a thin dark band near trailing edge, with a white band at tip of tail. Dark bar on leading edge of underwing. Immatures with gray-brown tails. Tails have several dark bands. Dark phase dark brown below with dark wing linings. 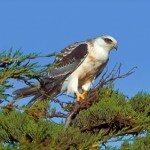 Habitat: A variety of habitats, usually a mix of open space for hunting and scattered clumps of tall trees to nest in. Where in Nebraska: Uncommon summer or permanent resident across the state. More common in east. Common spring and fall migrant. Regular breeder. 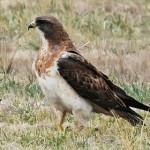 Fun Facts: Red-tailed Hawks are the most common hawk often seen soaring by roadsides. Often uses old nests in alternative years.